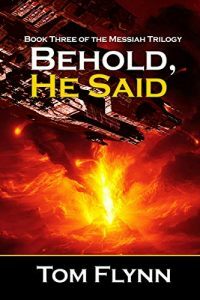 Behold, He Said, by Tom Flynn (Double Dragon Publishing, 2018, ISBN 9781790470907) 778 pp., Hardcover, $27.99. I hesitate to accord Tom Flynn’s deliriously erudite oeuvre the familiar label “cult books,” since cults are among the many human follies this witty and adroit novelist takes to task. In any event, the coterie of discerning fans who embraced Galactic Rapture (2000) and Nothing Sacred (2004) will be delighted to learn that the irrepressible trendrider Gram Enoda is finally back, along with 113 additional characters (some familiar, some not), plus the usual 42,000 human-inhabited planets that form the sprawling background of these cosmological comedies. Early in Behold, He Said, we’re told of a Terran sage called Stanlee, a clue that prepares us for the Marvel-inflected central narrative, which is, of course—how could it be otherwise?—saving the galaxy. To dramatize this quête du millénaire, the author transports his readers into a zone of gloriously entangled plot threads. (Imagine a brigade of Theseus doppelgängers solving multiple labyrinths to track down a herd of Minotaurs.) The most amusing of these throughlines finds the human race experiencing the unexpected Milky Way–wide restoration of a certain kind of dualistic apparel essential to the bipedal lifestyle. We learn the details when Senator Pamela Grice discusses the phenomenon with Gram Enoda and an intelligent machine boasting moral personhood.